On Sunday night I watched a documentary about the ills of an animal based diet. Dairy products are full of puss, the pork industry ruined the state of North Carolina, and chickens, well, chickens are even worse. Processed meats are killing us faster than cigarettes, and if we eat animal products we’re all going to die. The next documentary on my screen was about the perils of grains and beans, because those, too, are killing us. Eat meat, cheese, and full fat dairy, and then you’ll live forever. Regardless, I switched off the documentaries and decided that a plant based diet was the one for me. But what a ridiculous thought that was, because it was Tuesday night and I was hungry not for grains and carrots, but for cheese and sausage. (For my diet fiends, don’t start lecturing me now, because alcohol is as carcinogenic as sausage, so remove the plank, etcetera and etcetera). I wanted to visit a pizza place farther to the north in Elkhorn, but alas, Tuesday is the day that pizza places like to rest. Besides, my son was playing baseball in Williams Bay and the game was running long and the runs were piling up, so I did what any father with hunger would do: I drove to Larducci’s in Elkhorn to pick up a pizza. This way I could satisfy my need for a blog post, satiate my hunger, and arrive at the end of the baseball game with whatever was left of the pizza. Hero, all around. Knowing that Larducci’s isn’t a dine-in establishment, I called the restaurant from the baseball field to place my order. Larducci isn’t just the name of the owner/chief pizza maker (presumably) and the restaurant, it’s also the name of their version of a Supreme. But unlike other Supreme concoctions, this pizza boasted pepperoni, sausage, mushrooms, red onions, and a smattering of red, yellow, and green peppers. While the menu doesn’t mention it, there was also some canadian bacon thrown in for good measure. My Sunday night self would have abhorred this animal based dinner, but my Tuesday night self placed the order and drove to Elkhorn with anticipation (I called at 6:08 and was told the pizza would take 35 minutes). It should be noted, that’s the third time I’ve ever driven to Elkhorn excitedly. The first time was when I was driven in utero to be born at Lakeland Hospital. The second time was when I was driven to the DMV to take my driving test. This was the third time. Sorry Elkhorn, there have been no other times. Larducci’s isn’t much of a restaurant space. It’s a small brick building behind Lyle’s Appliance on Some Street in Elkhorn. Open the door, and there’s just a kitchen. Some work stations, coolers, and open air conveyor ovens, the sort Quizno’s used to roast your sandwiches in, back when there were Quizno’s outside of airports. A man met me at the counter, and while he never mentioned his name or his position, I assumed he was the owner and head pizza maker. We exchanged some pleasantries about the coming storm while I eyed my pizza making its way, slowly, through the oven. I paid the tab, $23.21, scribbled in a tip, and waited. But this wait was different than my other waits. Since there was no buffer between patron and chef, I asked the man how long the pizza needed to bake. Eight minutes, he told me. I asked how long his dough took to make, and if there was a constant starter that he kept on hand, or if each batch was from scratch. He told me that he’d love the dough to have two or three days, but it can be ready after a minimum of one day. He talked about the dough as a baker would, not as a chef who pulls a thin crust from a plastic freezer bag. In the background, a younger man dotted a pizza with hunks of sausage. He said he, too, likes making the dough. The two men were happy to be here, happy to be making my pizza. There was pride in this effort that I haven’t yet seen on this tour. That’s likely because I was essentially in this kitchen, rather than separated by the drywalled line that typically hides chef from patron, but even so. I appreciated this man’s candor, his effort, and his desire to make a perfect pizza. After checking on the pizza twice, both times saying that it wasn’t quite ready, he pulled the pie from the oven and took it to the box. He asked if I’d like some red pepper flakes or parmesan, I declined, and instead only received a sprinkling of fresh chopped parsley. A nice touch. We talked a bit more about outdoor pizza ovens, about the dough, about the difficult but short winter we had just endured. I left with my pizza and felt content to have encountered this pizza maker. Now, any regular old slob might have opened the pizza box right there in the parking stall in front of the restaurant. I’m not that regular slob, so I had the decency to pretend to drive away, as if I were driving home to deliver dinner, our quarry, to my waiting family. But instead of driving home, I drove to the stop sign and opened the box. This was a beautiful pizza. Easily the most beautiful of this tour. I took a bite. And then a few more. And a couple of pieces later, someone had the nerve to pull up behind me at the stop sign and suggest with a tap of their horn that I should drive forward. Elkhorn, I thought as I shook my head and licked the sauce from my fingers. Elkhorn. The immediate difference between this pizza and every other I’ve had to date is the crust. This crust smells of yeast, and that’s the sort of smell that a dough can only find by spending a day or two developing. The interior of the pie was impossibly thin, but still gathered the strength to hold up for the flop test. The exterior was a raised crust, uneven, to prove the hand made origins. The dough wasn’t particularly airy, but it had a nice chew, again a result of that time spent proofing. The cheese was well browned and the vegetables (mushrooms from River Valley Kitchen) were adequately softened. The sausage was serious and didn’t suffer from an overdose of fennel. Thanks to the fine folks at Hometown Sausage Kitchen in East Troy for this lovely sausage. 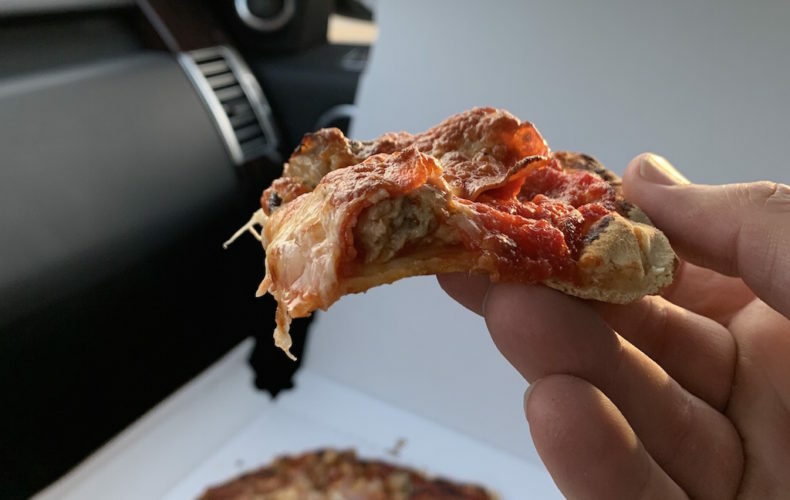 Things were looking up, and as I left Elkhorn where it generally belongs, in my rear view mirror, I delighted in this new to me pizza place, and in this delicious pizza. But as time wore on, I noticed the cheese was different. It was nuttier, almost like a gruyere, or other alpine cheese. Was that because this mix had mozzarella and provolone? Was there something else to this cheese? Either way, I would have preferred a different cheese, and if this pie had the cheese, say, of Harpoon Willies or Pino’s, I would have raised up Larducci’s as the new standard. I should have asked the chef when the pie came out of the oven what his cheese blend was. It was noticeably browner than a typical pizza, perhaps owed to this different cheese blend? With the possible caveat of the cheese, this was a most delightful pizza. I was impressed by this chef. Impressed by the care and attention paid to this pizza. This man loves pizza, and as a fellow admirer, I greatly appreciated this encounter and his product. The fact that he sources his sausage and mushrooms from local purveyors is more proof of this passion. Next time you find yourself lost in Elkhorn, or just hungry in Williams Bay, do yourself a favor and get a Larducci’s pizza. It’s a winner. Is it better than Harpoon’s? On this night, no it was not, but it’s darn close, and that earns it a starting position in your animal based diet.